Be the first to share your favorite memory, photo or story of Elizabeth Anne "Beth". This memorial page is dedicated for family, friends and future generations to celebrate the life of their loved one. 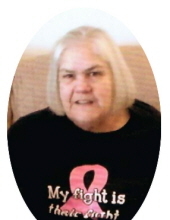 Elizabeth Anne “Beth” Crail Donovan Scott, age 67, passed away on Tuesday, November 20, 2018, at Northfork Senior Living in Morehead. Born July 28, 1951, in Cordova, Alaska, she was the daughter of the late Charles Joseph Crail and Elenor May Altman Crail. Beth was also preceded in death by her “second” mother, Elizabeth Marie “Betty” Cooper Crail; a brother, Bernie Crail; and a sister, Mary Catherine Crail Thomson. She is survived by four sons: Anthony and Shannon Donovan of Nashville, Tennessee, Timothy and Angel Donovan of Morehead, Andrew and Leigh Anne Donovan of Versailles, and Matthew Donovan of Morehead; one daughter: Kaitlynn Scott Howard and Chris Howard of Berea; and six grandchildren: Ian Donovan, Madison Donovan, Jaycee Donovan, Lily Donovan, Teysean Scott-Terry, and Anaiyah Scott. Other survivors include one brother: Stephen Joseph and Donna Crail of Morehead; four sisters: Nancy and Sam Estes of Morehead, Julie Beckmann of Russell Springs, Theresa and Chuck Davis of Morehead, and Vicky and Fred Cooper of Morehead; and numerous nieces and nephews. Beth was a homemaker who loved her family and absolutely adored her grandchildren. She enjoyed visiting with family and friends and never met a stranger. Her friendly, caring spirit will be greatly missed. Beth was a member of Jesus Our Savior Catholic Church. A funeral service will be conducted 10 a.m. Saturday, November 24, 2018, at Northcutt and Son Home for Funerals Memorial Chapel with Deacon Bill Grimes and Deacon Dan Connell presiding. Burial will follow in Brown Cemetery. Her children and Sam Estes will serve as pallbearers. Visitation will be 6 p.m. to 8 p.m. Friday, November 23, 2018, at Northcutt & Son Home for Funerals in Morehead. In lieu of flowers, memorial gifts are suggested to Christian Social Services, 1446 East Main Street, Morehead, KY 40351. To send flowers or a remembrance gift to the family of Elizabeth Anne "Beth" Crail Donovan Scott, please visit our Tribute Store. "Email Address" would like to share the life celebration of Elizabeth Anne "Beth" Crail Donovan Scott. Click on the "link" to go to share a favorite memory or leave a condolence message for the family. memory of Elizabeth Anne "Beth"